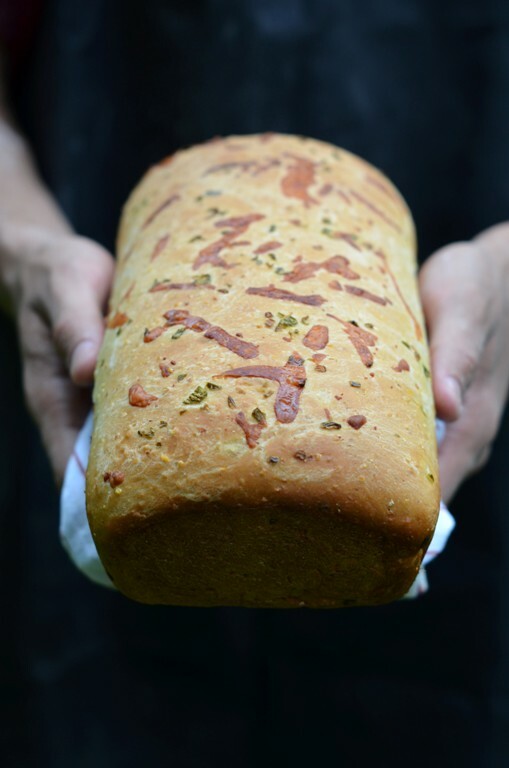 My heart has been repeatedly set on baking a jalapeno cheddar loaf each time I was at the bread counter tasting samples and going for seconds. I resisted for years buying an entire loaf as I was planning on baking it any day now. Something about it screams summer to me and I can see it being a part of a backyard fiesta with water sprinklers and kids running around, but wait, not so fast, easy! Insert here an image of an equestrian pulling on his or hers horse's reigns! I've got to make my life harder! First, I put a question out there on twitter, which cheddar cheese is your favorite? After tormenting about it some and a couple of grocery stores later I ended up with a fancy one. It tasted nothing like the good old cheddar, so I ventured again wandering into the world and bought two different good ole' American ones. Maybe just flavors I am accustomed to?! Old habits die hard so use any cheddar you are familiar with and love. In the shuffle of the tweets the message disappeared, but someone suggested I use both orange and white cheddar cheeses. The white aged longer and more distinct in flavor. The yellow just regular to give the loaf a color pattern. Three loaves later, one given to S's friend whose mom was away, and the other we dug into before I had a chance to snap any pictures of either. Still I was not 100% satisfied, I wished to achieve a golden hue but was getting a more dark color and hollow sound when tapped on the crust. On some loaves it's ideal but not on my Jalapeno Cheddar one, so I presented on twitter and facebook my dilemma and hoped for salvation. Sure enough @TalkingTV, @sunchowder, @RoxanaGreenGirl, Alan Cooke of Rebel Pie - defy 'ordinary' pizza and J's mom's cousin came to the rescue and we had a game plan. Brush the loaf with some oil and cover it with foil. It worked wonders. Thank you all who helped and chimed in with your favorite cheddar brands and made technique suggestions on how to keep the crust golden. You can follow me on twitter @foodwanderings, befriend Shulie Foodwanderings and like Food Wanderings on Facebook to follow the conversations. As you can see, I commit the same crime over and over again and slice the bread while it is still warm. I need to be put on probation, but admit it, doesn't the gooey melting cheese look so scrumptious? Original recipe with three different loaf sizes and different kneading methods please find at Red Star Yeast's website here. You will also find a different photo on RSY's site. This post is part of a series of a professional collaboration with Red Star Yeast. In a mixer bowl combine yeast, 1 cup flour, and other dry ingredients, except the jalapeno and cheese. Into dry ingredients add 1/2 cup plus 3 tablespoons water heated to 120°-130°F and oil. Mix the dry and wet ingredients, wrap with a plastic wrap and let cool. Attach a the kneading hook attachment to the mixer, add the egg while kneading on low/medium. Gradually add the remaining 2 cups of flour and remaining 1/4 water and knead with dough hook 5 to 7 minutes until smooth and elastic. Cover dough with a thin film of oil, put back into the mixer bowl, cover with a plastic wrap and let rise in a warm place for approximately an hour. I heat up the oven below to 350F and let bowl sit on top of the stove above. Sprinkle some of the jalapeno into the work surface.Punch down dough to remove air bubbles. Roll or pat into a 14 x 7 inch rectangle on the work surface. The sprinkle of the jalapeno will be underneath at the bottom. Spread most of the cheese and the remainder of the jalapeno on top of the rectangle and roll dough from the narrow side. Reserve some cheese as a garnish. Pinch edges to seal and tuck under. Place rolled dough, seam down, into a 5x9x3 greased loaf pan. Sprinkle on top with remainder of the cheese, press the cheese gently into dough, cover with a plastic wrap and let rise for approximately an hour or until it doubles its volume. Brush the top of the dough with oil and bake for 30-35 minutes. 20 minutes into baking turn the pan 180 degrees and cover with foil. Bake for another 10-15 minutes, take out of the oven and let cool on a rack. Covering the dough with foil makes sure the loaf stays beautifully golden and doesn't darken. The crust stays nice and moist as this type of bread should be. You can liberally brush the loaf pan and the top of the dough with oil. It will give you a crispier, fried like texture all around. A beautiful bread! What awesome flavors. Baking challenge accepted! Now I am hankering for this rich bread with some crisp and sharp flavors of an arugula salad. How about some avocado to mellow out the sharpness, a few chopped buttery nuts to add texture.... and voila! I'll keep that bread warm, rather than throwing it into the cooler with the salad and dry white vino. Perfect summer dinner at the beach. Thanks, Shulie! This loaf looks marvelous! Seriously, Shulie! You created one amazing jalapeño cheddar loaf (which, by the way, is one of my favorite breads). oh my! This looks and sounds heavenly! It turned out absolutely lovely Shulie! Seriously amazing. Thank you so much all for all your kind words. The whirlwind of madness paid off. Forgot to mention I wrapped two slices each in foil and put in a freezer ziplock bag and froze half of this loaf. I love it as a safety net when, yes believe it or not, we have nuttin' left to eat in the house. Would be perfect with avocado when we are down to basics! :)Reheat in foil for 10 minutes in a preheated 350F oven. Cheers! What a work of art, Shulie! You waited it out and executed it perfectly! I have had a wonderful sharp white aged Cheddar from Cabot. I could certainly make two slices of yours a meal....mmmmmmm. What a delicious sounding bread. It looks great! Shulie, what an awesome looking loaf! Irresistable and tempting. Delicious. Wonderful bread! And amazing photos :-) Pinned! Oh, yes yes please! What a fantastic bread. I love that with each slice comes a cheesy goodness. Thanks for sharing, I have to try this soon. Fantastic looking bread! The reward for cutting it while still warm is the melting cheese, how can that be wrong! It´s hard to find cheddar here, but worth the try. You must have some specialty stores. It's Buenos Aires after all:). I completely get it though it is hard to find certain cheeses even here in the States. the bread turned out so beautiful Shulie! You did an amazing job! Happy you didn't give up! Any suggestions for a mixerless process? Yes there are few methods if you click on the link to the Red Star Yeast original recipe in my post. A kneading by hand, mixer and food processor. Also tips on using other yeast and 3 different loaf size recipes. I bake the medium one. I hope this helps! TY so much everyone for your kind words and encouragement! I'm happy that I'm not the only one who needs to go on probation. I'm awful and my husband is worse. Not only does he cut it too soon but the whole thing is squooshed when he's done. I've started not telling him it's out of the oven yet. Now if I could just convince myself of that. I love this cheddar bread. Looks delicious. Shulie..I am madly in lust with this bread. In fact, I want it so much, I'm going to make it this weekend :) Hot pepper anything plus cheese in bread is my new obsession! Hi, I’m Sonia, italian foodblogger sorry for my bad english, I want tell you that I have included the link of this recipe (which I liked very much) in the section on my blog dedicated to “10 ways to make” (“10 Modi di fare”) aromatic bread. TY Sonia for including this link in your lovely roundup. Love your site.